From the saddle below the radio towers, the snow muffled—nearly muted—the sounds of the city. The breeze carried the neutral scent of a below-freezing day. Gray emerged in patches through white where the tops of Gambel oak rose above the untouched snow. A piercing, clean blue sky contrasted the rolling tops of the hills. Everything was still. No birds, no people—just me, my dogs and a little orange sled. While part of me wished to prolong my stay at the top of the mountain, I felt eager to begin my descent. It was to be my first attempt at sledding Red Butte’s Living Room trail, and my analysis of the chute seemed promising. The trail was well packed, but still soft. Rocks and sharp objects were buried under snow. The high banks made a perfect half-pipe to funnel the sled, and the average pitch—about 10 percent—was steep enough to keep me moving at a good clip. It was almost perfect—except for sections where the trail narrowed too much. I worried about steering around turns with no trail to grip. Would I be able to brake quickly should I meet a hiker coming up? The loose snow banks—barely wide enough in places for the sled—might be a drag, falling in on me and slowing me down. But, for an extreme sledder, these questions were only challenges to overcome. My foray into extreme sledding began after college, thanks to a seasonal job that left my winters open to play. I passed a lot of time skiing, by myself. But, temporarily unemployed as I was, I couldn’t justify paying for a lift ticket more than once or twice a week. I took up sledding while trying to save money and still get my downhill thrills. I firmly believe that if you spend the time and energy hiking up, there should be some reward coming down. Porter Fork, up Millcreek Canyon, was my first track, and a perfect beginners run. The trail, wide and obstacle-free, tunneled just enough to keep my sled easily in the track. Using a 5-foot-long blue plastic toboggan, I rode my first trail from the wilderness boundary sign down to the canyon road, shouting the whole time like a child going down a slide. Porter Fork became my go-to when friends came to town, but out on my own, I continued to expand my territory. I tried routes up and down Millcreek and found a favorite along the Bonneville Shoreline Trail near Hogle Zoo. All the while, stories from the underground sledding world told me I was not alone. They also whispered of an extreme sledding mecca: Neffs Canyon. For a long time, Neffs lay out of reach, too extreme even for me, until finally, last winter, I earned an invitation from two friends, fellow extreme sledders whom I trusted completely. We started hiking an hour and a half before dark. New snow had fallen that day, and the trail we made was fresh. 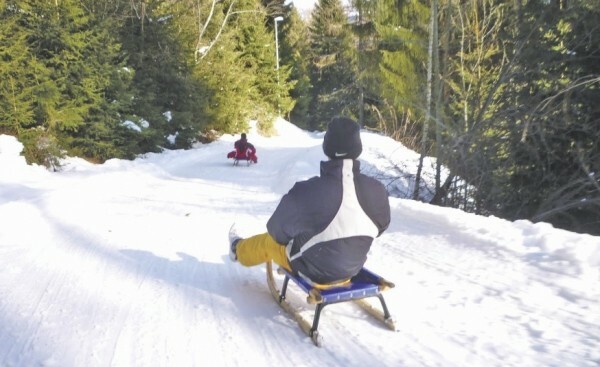 Neffs is a narrow, steep canyon, and perfect sledding terrain. It’s an expert run that needs some fresh powder to lower the chances of bruised ribs and tweaked kneecaps. It also doesn’t hurt to bring some safety equipment. With the sun quickly dipping under the scrub oak and behind the Oquirrhs, my friends halted and dug into their packs. They pulled out three bike helmets, some kneepads, headlamps and one full-body, hooded suit made of Tyvek. It was the best thing they had found, they explained, to keep them dry and warm. They handed me a helmet and ski goggles, and shoved off. It was an epic ride. Back to the Living Room. The track turned out to be slow-going at the top—too narrow, just as I had expected. Halfway down the upper section, though, I picked up speed. Flying through tight blind turns, I felt like an Olympic luge competitor coming into the finish. Accelerating, white rushed by me on three sides. Visions ran through my mind of Calvin & Hobbes’ sledding adventures, the ones that end in midair freefall. If I made it to the bottom unharmed, I promised myself, I would come back the next day. After all, why waste such perfect conditions?